Filamatic, Model DAB-16-4, automatic, inline, 8 head piston filler. Rated from 3 to18 cycles per minute with number of container – depending on materials and application. Fill range of: 60cc to 520cc with proper change parts. Equipped with 3¼" wide x 112" long delrin container conveyor currently set with (8) FKS 130cc pistons with fill accuracies of ± 0.5%, pneumatic gate indexing, (3/8)" OD diving nozzles and Control panel with on / off switch, strokes per cycle selection and variable speed dial. Mounted on heavy duty base frame. Filamatic, Model VLD, 4 head inline piston filler. Rated from 12 to 72 bottles per minute with a fill range of 60ml to 520ml with proper change parts – depending on materials, application and machine configuration. Equipped with 96" long by 3¼" wide Delrin conveyor, star wheel indexing, adjustable guide rails, (4) 520cc pistons and (4) (5/8)" OD diving nozzles with positive cut off mounted on a 16" long slide bar. Control panel with Omron PLC and push button start / stop / reset / e-stop controls. Mounted on base frame with leveling legs. Filamatic, Model DAB-16, automatic 2 piston filler. Rated from 3 to18 cycles per minute with number of container – depending on materials, application and machine configuration. Fill range of: 60cc to 520cc with proper change parts and is equipped with (2) FKS 130cc pistons with fill accuracies of ± 0.5%, pneumatic gate indexing, 7/16" OD diving nozzles and a 3¼" wide x 102" long delrin conveyor. Control panel with on / off switch and variable speed dial. Mounted base frame with casters and leveling legs. 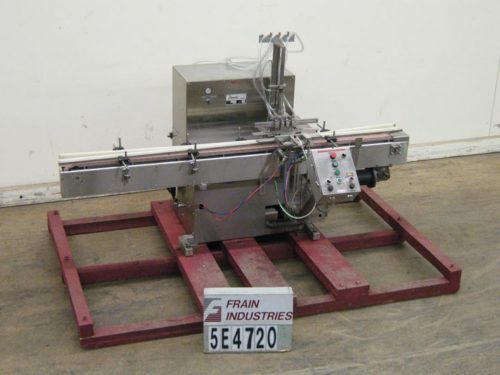 Filamatic, Model DAB-5-4, automatic four head piston filler. Rated from 4 to 72 bottles per minute – depending on materials, application and machine configuration. Fill size: 1 ml to 130 ml. Fill accuracy: ± 0.05%. Change parts required to accommodate fill / size range. Equipped with diving nozzles and bimba indexing. Automatic, S/S, 4 head, inline piston filler rated up to 40 cpm – depending on materials and application. Equipped with 3" wide Delran conveyor, pneumatic cylinder container indexing system, four FUS 60ml (2 oz) pistons, diving nozzles and e-stop. Mounted on a S/S frame. Able to accommodate piston sizes up to 520ml. Automatic, stainless steel, 6 head, inline, closed environment, piston filler rated from 12 to 60 containers per minute – depending on materials and application. 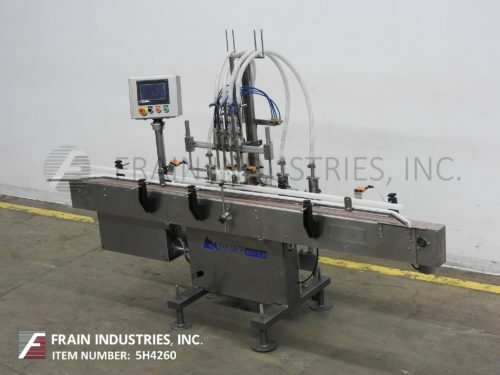 Equipped with a 144" long Delran conveyor, container indexing system, six FSV XL 560cc pistons, 5/16 OD nozzles, centering guides, bottom up fill and micrometer fill drip controls. 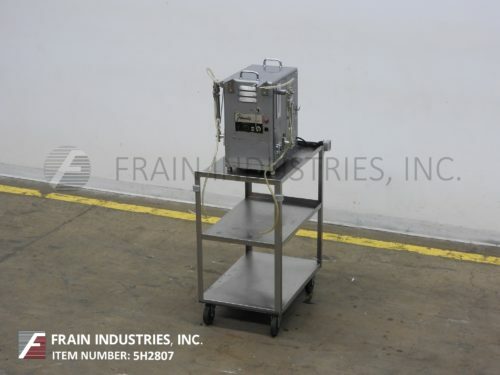 Enclosed fill area capable of hot fills up to 200 Deg F. Additionally features Lexan guarding. Piston fill range from 1ml to 560 ml with proper pistons and assemblies.